NWT Lot of Spiritual Gangster Women’s Sweatpants Shirt $150 Size Medium Condition is New with defects the green namaste sweatpants have discoloration along side (check photos) new with tags! $150 retail email me with questions! THESE WERE ACQUIRED FROM A K-MART BUYOUT! You will not be disappointed. I WANT TO MAKE YOU HAPPY AND FIX THE ISSUE. I WANT TO HELP! Victoria’s Secret pink shirt XL, VS pink sweatpants XL, Perrin L (grey) which fits like the L. Lightly worn, discontinued styles. Lot of Womens Oklahoma Sooners Attire T Shirts Sweatpants L XL. Condition is Pre-owned. Shipped with USPS Priority Mail. Pair 3 : Size XL Roxy blue, white & yellow polyester athletic sweats pants with an open back pocket. Pair 4 : Size 2 (XL) Chicos Travelers black solid acetate spandex blend (95/5) athletic dress leisure pants. One is black and says San Juans on the front and has a boat neck. The next piece is a pair of light gray sweatpants from Hanes. However, credit cards are accepted. 🔹HOODIE by "JERZEES" > Pink with front pocket - 50% Cotton 50% Polyester. 🔹BLAZER TOP by "TANGO FASHION" > Purple with 3 button & lace, flower designs in front & tie in back > 100% Rayon - Made in USA. *SOLD AS IS* READ!! Store send backs with minor defects. All pictured Everything is NEW WITH TAGS or WITHOUT TAGS 6 Items Size XS or 0 NWT Sweatshirt Hustle, XS Retail $24.99 - seam came apart on top sleeve. NWT Premium High Rise Jeggings, White 0 Retail $34.99 - Ink on back seam between pockets. NWT High Rise Leggings, Navy Blue XS Retail $14.99 - Hole on side leg. NWT Tie Top, Floral XS Retail $19.99 - long seam apart around neck. NWOT Sweatpant Joggers, Gray XS $24.99 - seam apart on leg. NWOT Sweatpant Joggers, Red XS $24.99 - seam apart on back seam. Smoke free home. Take a look at my other items. Thank you! 🔹BATH ROBE by "OASIS" > Pink with belt & pockets. 100% Polyester-Made in China. 🔹2 PC PANTS SET by "ERIKA" > Gray black red with collar & zipper on jacket & elastic waist in pants. 36% Cotton 36% Polyester - Made in Turkey. The athletic shorts are by Augusta sportswear. The pink and gray stripe top is by Epic Threads, the tie dyed top is by Hanes, and the romper is by xhilaration. They have it listed as sleepwear, but I could also see it as a comfy outfit to wear whenever you wanted. Women's clothing lot of 3 size S-M Zara sweater Danskin hoodie S sweatpants. Condition is Pre-owned. Shipped with USPS Priority Mail. Button Down Plaid Shirt. Blue (Navy) and White Stripe. Elastic Waist. 100% Cotton. Good Preowned Condition on this lot. No stains or holes. Sleeve Length: 23". 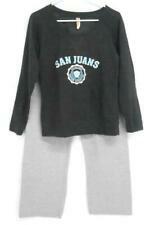 Includes nice blue set of sweat pants, and two nice hoodies. Stitches and Seams stands behind our goods and services and want you to be satisfied with them. All pre-loved shoes are thoroughly cleaned and disinfected. NWOT - Felina Lounge Pants do not include top! Fantastic deal for 6 pair! Lot includes 3 pair of Champion (2 light blue, 1 green), 2 pair of Felina (1 red, 1 black) and 1 pair of 32 degrees sweat pants! Functional drawstring on pant with jogger style cuff. 32 DEGREES Ladies’ Tech Fleece Jogger, Black. Super Soft Fleece Jogger Lounge Pants by Weatherproof and extraordinarily comfortable. Perfect balance between being too snug and too baggy, these pants fit just right.